Music binds all of us together; there’s music reflecting every emotion. And for many of us, music is a way of expressing ourselves – our anger towards society, our love for our companions, or the joy we feel about life! Music forms an important tool to emote and create a space for dialogue. 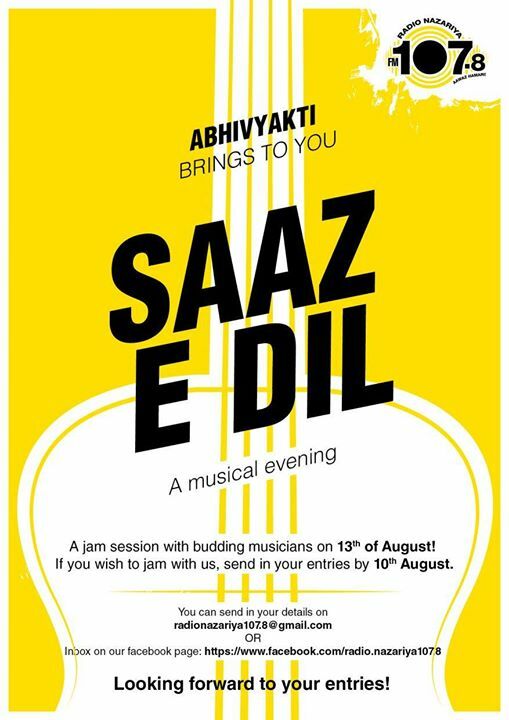 In this essence, they bring to you Saaz-e-Dil, an informal jamming session where they invite budding musicians of the city to come and jam with us. If you wish to participate, you can register yourself by sending your details at radionazariya107.8@gmail.com; The first 15 participants who register would get a chance to jam on Sunday! And to those who enjoy listening to music, especially live music, do come and become a part of this session as the entry is FREE!